I was able to take this old gal last Wed. evening. She tipped the scales at 99 pounds dressed. 126 pounds live weight. Good size for this area. I took her with my ACS 57lb at 29.5, Gold tip 300 with a D&M cresting and fletch. Tipped off with a 200gr single bevel Gizzly. She only made it 40 yards. This is how I found her. If you look closely you can see the exit wound near her elbow. Very little blood due to it pooling in her arm pits. I had to follow pug marks to trail her. I do have a question. 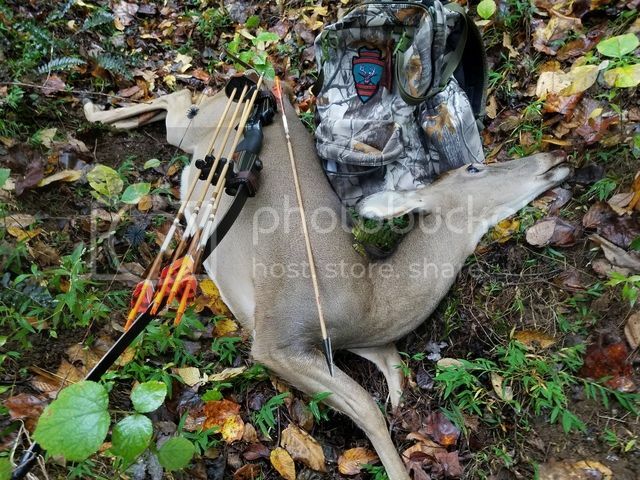 Being you like to hunt in rugged country, and get there early so as to beat the crowds, how did you manage to get that big girl out of the woods? Good going Nook-way to start the season.